In less than a week's span, the Chennai Super Kings have beaten the Kolkata Knight Riders twice and have asserted their position at the top of the points of the table. Suresh Raina with his half-century and Imran Tahir with his four-wicket haul starred in CSK's win at the Eden Gardens. An unchanged Chennai Super Kings opted to bowl first against Kolkata Knight Riders. KKR had their regular openers - Sunil Narine and Chris Lynn - back in the squad just in time for the crucial fixture. Narine got dismissed by Mitchell Santner without doing much damage to the scoreboard but Lynn was connecting the ball extremely well. KKR's innings was completely about him as the rest of the batsmen failed to make a significant impact. During his stay lasting 51 balls, Lynn scored a total of 82 runs by hitting 8 fours and 7 sixes. Lynn was piling runs for KKR, Imran Tahir kept on chipping away wickets at the other end. He dismissed both Nitish Rana and Robin Uthappa before dismissing Lynn and Andre Russell in the same over. After the double blow, KKR could not recover as Shardul Thakur and Deepak Chahar bowled excellently in the death overs. They could manage only one boundary in the last four overs and ended their innings at a sub-par 161 in 20 overs. 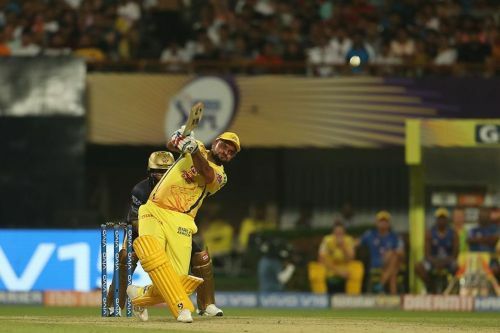 During the chase, the Chennai Super Kings too lost wickets at regular intervals but Suresh Raina batted through and ensured that their side ended up on the winning side. While Raina scored 58 off just 42 balls, Ravindra Jadeja too contributed with a useful cameo. Just when KKR were trying to pull things back after Dhoni's wicket, Jadeja smashed 31 runs off just 17 balls to take CSK home with 2 balls to spare. With this win, CSK have 7 wins in 8 matches. Still amused at how none of the experts gave CSK a mention in their Top 4 for this IPL. But now we are on the cusp of being the first team to qualify for the Playoffs. Write this franchise off at your own peril. Suresh Raina is given out LBW. Raina reviews, there is an inside edge and the umpire overturns it. The crowd erupts like a volcano. Next ball, he hits a four. The crowd erupts again. Match Chennai la ya Kolkata la ya? CSK fever is real, folks. Never in my wildest dreams would I have imagined the Eden Gardens crowd shouting 'CSK, CSK" louder than "KKR, KKR." Simply mindblowing. #ThalaEffect#IPL2019 #KKRvCSK. It is amusing how this bowling attack of CSK's is doing well game after game playing just 5 bowlers. I'm sorry but credit stealer Dhoni gets the credit here. He has managed them well, rotated them brilliantly and backed them constantly.